If you’ve never rented an RV for a vacation, you might want to consider this unique method of travel. Renting an RV offers the fun and flexibility of a road trip and also gives you a home on wheels wherever you go. Use these 15 tips to get the most from your first RV rental. Once you decide to take an RV trip, you have to determine what type of RV you’ll rent, where you’d like to stay, and what you want to do along the way. Once you have those decisions made, you can use that information to create your budget, plan any specific activities, and meal prep. Planning your RV trip from start to finish is the key to getting the most out of your RV rental. Because RV rentals are small spaces (even Class A motorhomes, the biggest type of RV on the market), RVing isn't for everyone, so you'll want to make sure everyone who commits will feel comfortable with this style of vacation. Talk with family and friends who are interested, and then read about what to expect at your destinations so that everyone understands the plan. If people are uncomfortable with any of the details, such as the duration of the trip, the activities, or simply being in a small space, they should probably skip this one. One of the biggest perks of renting an RV is that you can pretty much go anywhere you want. Whether it’s a national park, the beach, or staying at a luxury RV resort, make sure there’s something for everyone to enjoy along the way. This means looking for activities for any kids, making sure you and your partner have time alone or ensuring there’s fun for everyone no matter your destination. Once you know where you’re going and who’s coming with you, you can choose the right size motorhome to rent. You'll need enough sleeping space for everyone, enough space to lounge, the capacity to bring along everything you need, and it should have the right kitchen appliances for you to make meals at the RV park or campground. Pro Tip: Just because an RV says it sleeps six doesn’t mean it sleeps six comfortably, which is why you should tour the motorhome before you rent. Continue to 5 of 15 below. Budgeting will likely be an ongoing process as you research all the options for each step (renting, activities, necessities, etc. ), but you can start creating a budget now and adjust as you make more decisions. 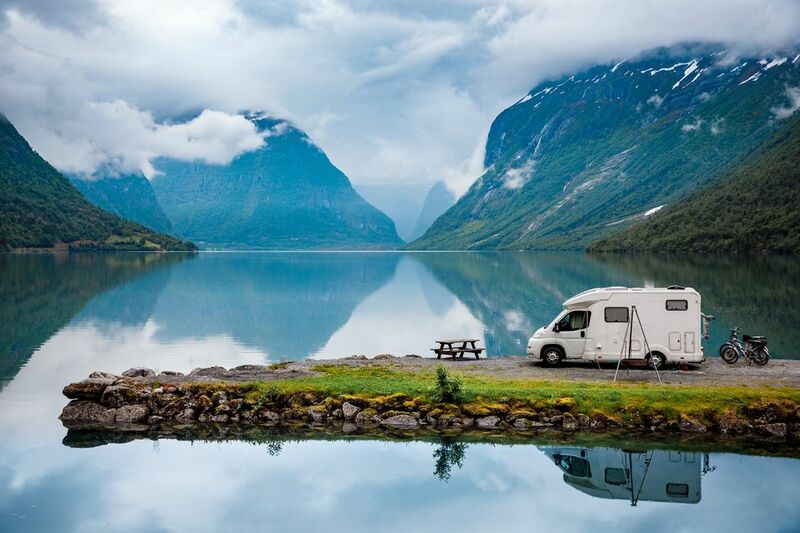 As you'll see in the following tips, your budget should include not only the RV you've chosen to rent, but extra fees with the vehicle, park and campground fees, amenities, and everything else along the way—where you'll stay (e.g. National Park passes), gas for the trip, spontaneous excursions, and meals and activities at each destination. If you want to rent a car anywhere for activities not suitable for an RV, you should plan for that, too. And always budget for miscellaneous expenses—you never know what might pop up that requires a little extra spending on or off the road. Keep these pieces in mind as you read through the next steps. Besides the base cost of renting an RV, there are a few other costs you should know about. You’ll need to put down a deposit upfront, you'll need insurance for your trip, and depending on the duration or destination of your trip (e.g. out of state), there are additional fees. Many RV rental companies also provide extra amenities at a cost, such as linens, kitchenware, generators, propane, and more. However, paying for some of the above, such as propane and a generator are cheaper upfront than trying to do so at an RV park or campground. There are many types of RV experiences out there. For first-time RV renters, you’ll want to go with the easiest out there. Stay at a fully-loaded RV park or campground that has full hookups, a dump station, and staff on site. Look at Kampgrounds of America (KOA) or ReserveAmerica to browse the accommodations. When choosing an RV park or a campground, read reviews from people who took a similar trip to the one you're planning. If they went to the same destinations you're considering, you'll be able to read about their experiences. You also want to make sure you’re staying at a place that has all the features and functionality you want during your stay. Private RV parks and campgrounds, especially ones closer to what you want to do, are often more expensive than discount communities, such as KOAs or Escapees RV Club. Continue to 9 of 15 below. RV parks and campgrounds can also have extra fees and pricing you need to factor into your budget. Most of these fees will be paid or known upfront when you book the trip, but others might occur when you arrive. Some of these extras include additional nights at a campground or RV park, propane, generator rental, or firewood. Plus, transportation (whether that's renting your own car or using a shuttle service or public transit) to and from the campground and what you want to do can also cost more. Gas mileage is terrible when you rent an RV, and there’s not much you can do about it, especially if you’re traveling during the summer. The summer months see gas prices skyrocket across North America, so be prepared. But there are some strategies to maximizing your gas mileage. You can even research cheaper places to stop for gas when you're planning your route. Typically, gas stations along busy stretches of highway will be the most expensive. Make sure you’re comfortable driving a motorhome before you rent one. Often, you can test drive one at a dealership or even take one for a spin at an RV rental location—they'll also want to know you’re at ease driving one before renting. Parking an RV at your destination can be tricky, too. If you’re having issues, ask for help from your fellow RVers or the park staff when you arrive. Don’t be afraid to ask for help—the RVing community is one of the most helpful around. RV hookups confuse many new RVers, but they’re not as tricky as you might think. Read the manufacturer’s manual that comes with your RV rental, and ask the dealership to explain how to hook up to water, electric, and sewer. If you’re still unsure once you arrive at the RV park or campground of your choice, ask for help from those around you or the park staff. Don’t connect to hookups if you're unsure—you could blow out the RV’s electrical system or cause waterline issues for the rig or grounds. Continue to 13 of 15 below. Dumping an RV wastewater task will not be a highlight of any RV rental experience, and it will be messy. If your RV rental company offers dump services, or your RV park or campground does, pay for it. It will be worth the expense. If you opt to do it yourself, ask for help if you need, watch online videos, and be prepared for things to possibly go wrong. Or consider going without tanks for the trip by using public restrooms and showers at your campground or RV park. One of the easiest ways to save money renting an RV is by making your meals. Your motorhome will come with a refrigerator, and if you have a generator or use electrical hookups, you’ll be able to keep your food edible. Consider stopping at a grocery store or Walmart on your trip to get refrigerated items. Bring your snacks, drinks, and meal prep breakfast, lunch, and dinner for your trip. Eat out only when you must on an RV trip, and plan that ahead of time, too. Finally, get on your way! Enjoy the experience and everything that comes with renting an RV for the first time. You may discover you love it and end up buying your own to keep the adventure going. Renting an RV is the best way to figure out if RVing is right for you or your family. While it may not be the cheapest way to travel, it offers you the chance to get away from day-to-day life, vacation differently than you’re used to, and experience adventure you wouldn’t get from other forms of travel. Should You Buy CDW Insurance for Your Rental Car? Do European Rental Car Companies Charge Dropoff Fees?